4.NBT.2 Generalize place value understanding for multi digit whole numbers. 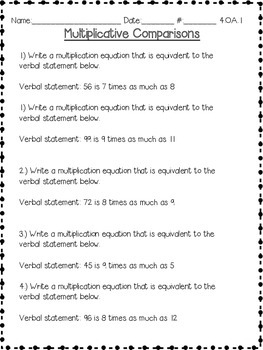 4.OA.1 Interpret a multiplication equation as a comparison e.g., interpret 35 = 5 x 7 as a statement that 35 is 5 times as many as 7 and 7 times as many as 5. 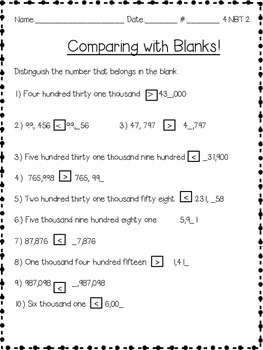 Represent verbal statements of multiplicative comparisons as multiplication equations. 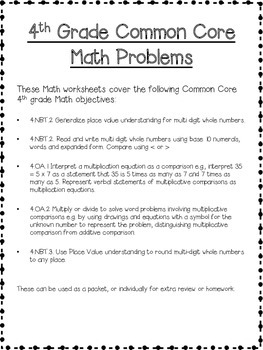 4.OA.2 Multiply or divide to solve word problems involving multiplicative comparisons e.g. by using drawings and equations with a symbol for the unknown number to represent the problem, distinguishing multiplicative comparison from additive comparison. These can be used as a packet, or individually for extra review or homework.